Charlotte Dujardin just have THE position when performing a test. The overall picture of harmony and correctness is in a league of its own, also when comparing the Queen of dressage Isabell Werth, and this weekends big winner at Leudelange LUX Steffen Peters with his two lovely top horses Suppenkasper and Rosamunde. For today's test the marks must have been including some serious 10´s for both extensions and passage tours, nice walk tour, good 1st piaffe, while the next two piaffe tours are with small unbalanced tensions. Strong canter tour with super nice series, small lack of balance for first pirouette and second pirouette slight overturned. But again the overall picture is just left with so much power, control and suppleness, and therefore also with space for small things keeping them away for 85% victory. Carl Hester and Hawtins Delicato showed a very controlled, well balanced and expressive test except for today's series where they were struggling with some errors. 77,298%. 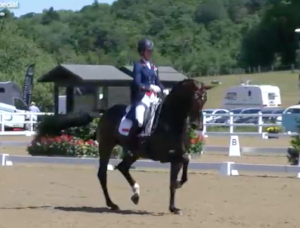 Henriette Andersen and Flavio came 3rd today with a very nicely balanced test. 70,957%. Unfortunately we did not get the name af the commentator at Clipmyhorse for the Grand Prix Special - for sure a highly knowledgeable lady with superb comments during the tests.